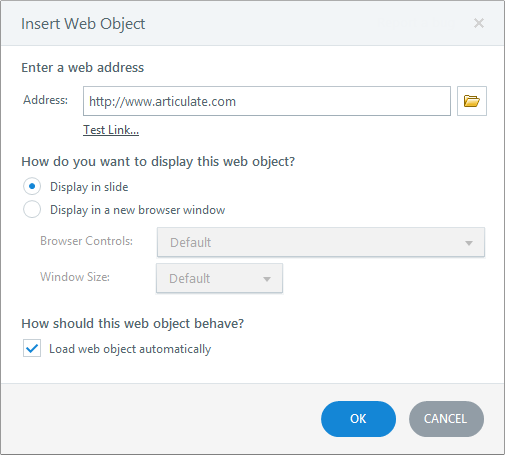 Web objects are a powerful way to leverage web-based resources by embedding them right in your Articulate Storyline courses. Take advantage of web-based applications, games, videos, reference materials, and more—whether they're online or stored on your local computer. Go to the Insert tab on the ribbon and click Web Object. The following Insert Web Object window will appear. If your web content is online: Type the URL of the web page in the Address field. Mark the box to Load web object automatically if you want your web content to load without any interaction from learners. 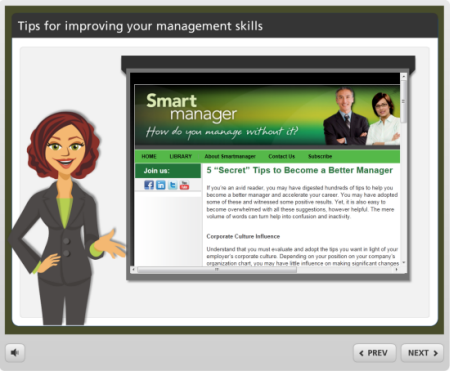 Uncheck it if you want your web content to load only when learners click it. Tip: When Load web object automatically isn't marked, it's helpful to give your web object placeholder a meaningful image, so learners know what it is. To do so, right-click the web object placeholder and select Change Picture. Browse to the image you want to use and click Open. If you change your mind about the image you added, right-click it again and select Reset Picture. If you display your web content in a new browser window (see above), decide how the new window will look. Use the Browser Controls drop-down to specify which controls the new window will have. Select Default if the new window should have the same controls as the parent browser window. Choose No browser controls if you'd prefer that the new browser window not have any controls. Use the Window Size drop-down to select a size. If you select Custom, fields for Width and Height will appear, so you can set the exact dimensions in pixels. If your web content is located on the Internet or an intranet, learners will need the proper security permissions to access it. Otherwise, web objects won't work for them. Web objects can't be previewed. To view web objects in your course, publish for the Web, Articulate Online, or LMS, then upload the published output to a server. To view a published course without uploading it to a server, publish for CD.